The international militant women’s movement has a great wealth of experience and achievements in fighting for the liberation of women. However, the fundamental side of what is necessary to create the basis for this liberation is severely underestimated. Only a revolutionary solution lays the foundation for the social liberation of women! An analysis of the major successes of the women’s movement and their actual limitations within capitalism. Lessons from history until today – revolutions were locomotives for the most far-reaching women’s rights so far. All of the many struggles taking place today are important on the way to the liberation of women, but they have to be led as training ground of the fight for the liberation of women. The goal of liberating women can only be achieved jointly, across ideological and party-political lines and based on principles. For this the militant women’s movement has to be non-party affiliated. This results from the common aim of the complete emancipation of women, the liberation of women in liberated societies. we are looking forward to this international gathering of women in India! It is a historic meeting – women of the world discuss together the theory of the liberation of women! Meanwhile we have received calls from all over India from women who want to participate in the seminar. That is very exciting! We also receive registrations from other continents! Welcome to Bangalore! The rented meeting room offers common sleeping facilities for about 200-250 women, including 4 rooms, 2 dormitories and halls in which they provide mattresses for sleeping. Staying overnight in a hotel – you have to rent them yourself. Those who stay overnight in the Massenquartier will get a breakfast there. If you stay overnight in a hotel, you will have breakfast there. There is tea and snacks as well as lunch for all. Dinner can be served to everyone in the meeting room if needed, but we thought people would prefer to eat outdoors at a time of their choosing. We are printing 10,000 posters to be hung all over India. We are currently calculating the cost of participation and sending it to the homepage! Sharmista Choudhury is free! International solidarity and mass protests in the country are successful! Our world woman Sharmistha and her fellow campaigners are free again! And further they write that the situation is very tense but Sharmistha and other activists are in a safe place. We, the workers of „Fortuna” Gračanica shoe factory and participants of European world womens conference of grasrootswoman, strongly condemn the brutal attack and abduction of activist Sharmista Choudhury and other leaders of the Bhangor-Movement! As woman, workers and fighters for worker rights in Bosnia and Herzegowina we were also victims of physical and psychic attacks and it is our obligation to the society and to the world to stand up against such attacks on individuals and activist groups. We demand for immediate and unharmed release of Sharmista and other activists! We call on the government to take action against such criminal activities and also we call upon the government to take steps to protect the activists in the country. With absolute horror and great anger we learned about Sharmista’s kidnapping and other guides last night. We know Sharmista as a combative and very committed woman. Her struggle for the environmental and popular movement “For land, livelihoods, ecology and environmental protection” is obviously also the reason for the cowardly attack on her and that she was attacked and abducted by thugs of the ruling party TMC. We, more than 60 participants from about 15 countries have heard about your struggle at our European Conference of World Conferences on Women. Your courageous women, Aida, Dita, Borac, have told us how the rights of workers* are trampled underfoot, how you are criminalized and humiliated. We send you our warmest greetings of solidarity. Your protest and struggle for your jobs, the punishment of the director for corruption and fraud that led to the destruction of your livelihoods are justified. Likewise, the punishment of bankruptcy trustees who have proved to be henchmen of capital is justified. Your struggle is one of many international struggles, so we need to strengthen our mutual consultation, information and coordination. This was a result of our European Conference of World Women. 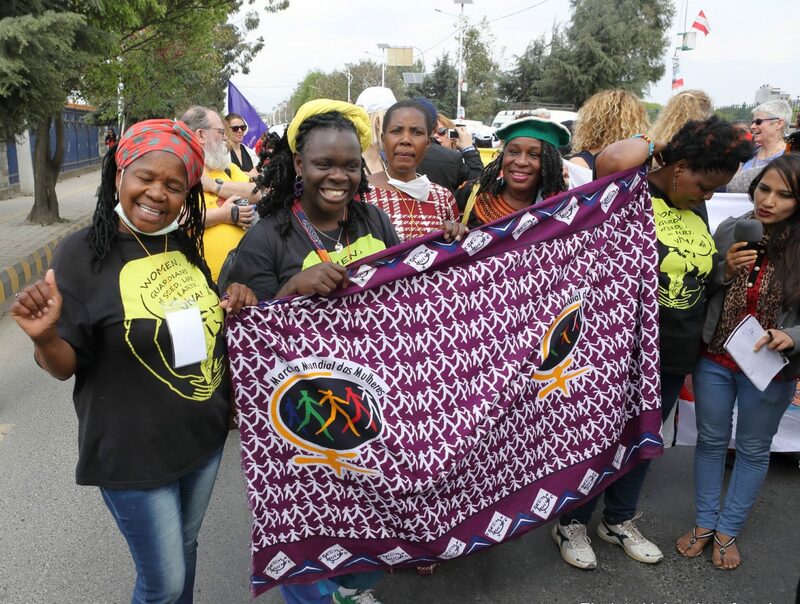 Continue reading “Solidarity of Europe’s world women with the striking Fortuna workers and their colleagues – Solidarity with the struggle of the trade union >Sindikat Solidarnosti< "